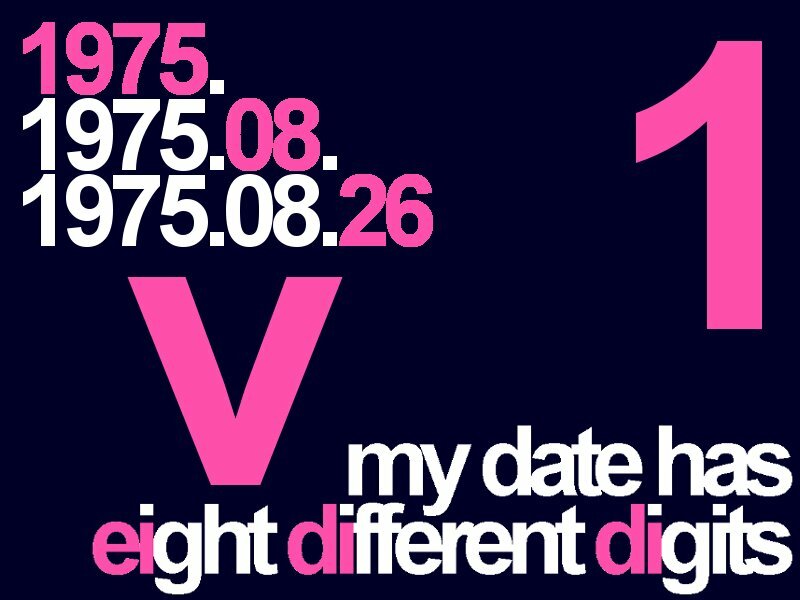 a birth date with eight different digits. like 06.25.1934 or 08.26.1975 or 04.23.1987, for instance. a very selective elite, an exclusive but very egalitarian club. social standing, income, region, opinions: none of this matters. just the eight digits of your birth date. about one percent of the world's population. a small minority scattered on the planet. and we have nothing against those who have repeated digits in their birth date. but we like dates with eight different digits better. that's why we've created eididi. and if you want it, we have a twice unique t-shirt for you. 1. does your date have eight different digits? welcome to the club! 2. go to the 'orders' page and complete the form. 3. show us a document that attests your birth date. show us you were born on one of the 'good days'. 4. personalize a t-shirt with your date and check out. 5. open your package and wear your t-shirt! t-shirts are 100% high-quality cotton (150 gsm, or 4.42 oz/yd2) and are available in different sizes in the unisex (S, M, L, XL, XXL) and women's (S, M, L) models. all models have a taped seam in the neck. the necks of unisex models are reinforced with spandex. embroidery and customizations are made in italy. front embroidery is in high stitch density cotton, extremely resistant. 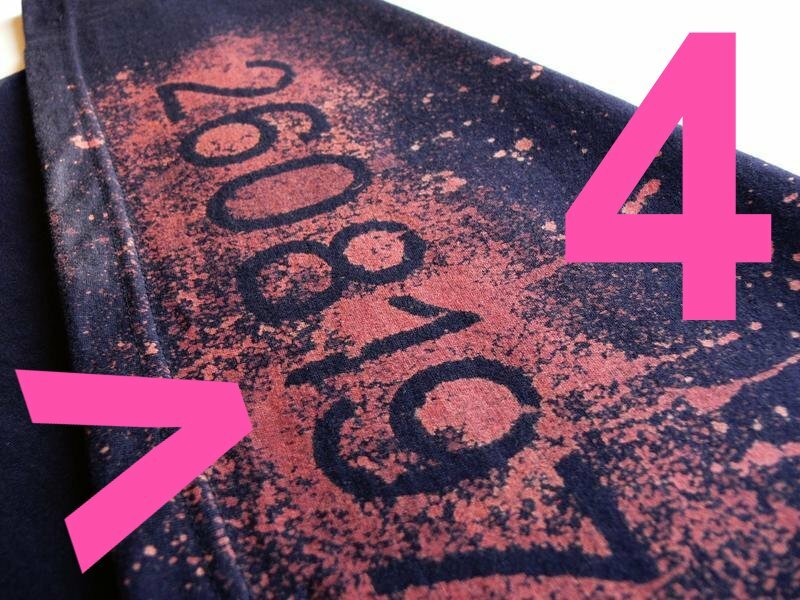 the date is craft-printed with chemicals, therefore every t-shirt is unique. after the chemical treatment, the t-shirt is thoroughly washed and can therefore be worn without being washed once more. bargain price for a limited period: each t-shirt costs 33 euros. when ordering, you can choose the preferred format for your date (month day year, day month year, year month day, and so on) and its position on the t-shirt. 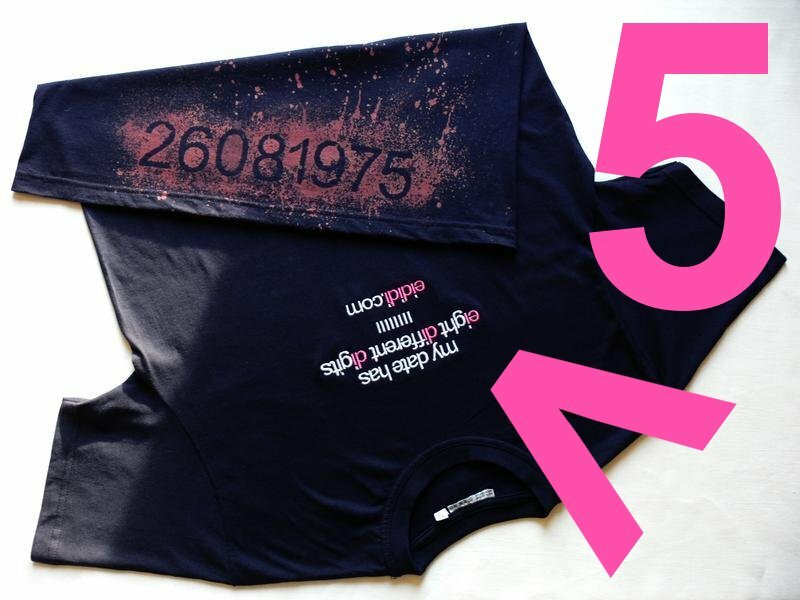 you can buy a t-shirt only if you can prove your birth date has eight different digits. 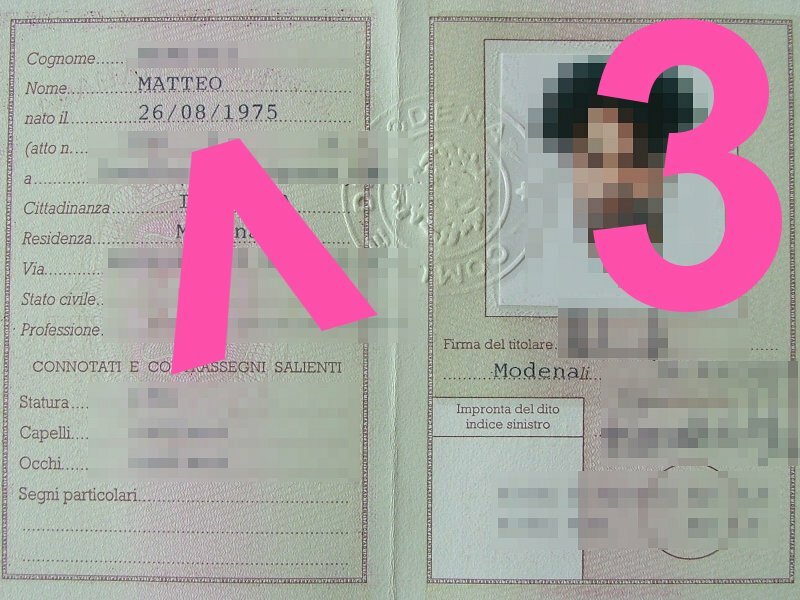 which means you must upload an image (ID, passport...). if you wish, you can blot out your picture and any other non essential data, but we'll be glad if you leave them visible, we'd really like to see your face. of course, we will treat your personal data with care and confidentiality and will comply strictly with privacy laws. though it probably won't happen, maybe in ten years we'll hold an exhibition with printouts of all the images and IDs. it would be nice, you never can tell. it's not mandatory for buying the t-shirt, but we'll be very glad if you authorize us to publish yours. first and last name must correspond to the document you uploaded. shipping will be via registered mail (proof of shipment and return receipt). shipping and handling charges depend on the destination: italy 7e / europe and mediterranean 9e / asia, america, africa 12e / oceania 13e. see popup for details. for shipments outside the european union, eididi will not be liable for custom dues and other charges. I authorize the use of my personal data in compliance with italian legislative decree 196/03. the only accepted payment method is paypal. many people like dates with a few repeated digits. some people are glad to be born on january 1st, or march 3rd, or july 7th. it's a great joy when a child is born on september 9th, 1999, or april 4th, 2004, or november 11th, 2011.
we're interested in dates with no repeated digits. whatever the format to represent it, dd.mm.yyyy or yyyy.mm.dd or any other, a gregorian date has eight digits. the possible digits are ten: zero one two three four five six seven eight nine. in theory, there's a little more than a billion possible combinations. of these, two million have all different digits. with dates, things become a little more complex. of course. not all digits can be in all places. let's take last century, dates from year 1900 to year 1999.
one and nine are used for the millennium and century digits. therefore, the first digit of the month can't be one and must be zero. this excludes, for each year, all dates in january, september, october, november and december. this also excludes the first, second and last decade of each century and, for each decade, the first, second and last year. for each month, the first twenty days are off the table, together with the thirtieth and thirty-first, which means the first digit of the day must be two. this also excludes february, the third year of each decade and the third decade of each century. having four locked digits (one for the millennium, nine for the century, zero for the month's first digit, and two for the day's first digit), we're left with six free digits (three four five six seven eight) for four remaining places (decade, year, second digit of the month and second digit of the day). let's pick a decade, for instance the one beginning with 1930.
our month can only be may, june, july or august. we have only three good days each month: the twenty-sixth, twenty-seventh, or twenty-eighth of may; the twenty-fifth, twenty-seventh, or twenty-eighth of june; the twenty-fifth, twenty-sixth, or twenty-eighth of july; the twenty-fifth, twenty-sixth, or twenty-seventh of august. our good days are the twenty-sixth, twenty-seventh, and twenty-eighth. to sum things up, there are three good days per month, which multiplied by four good months per year make twelve days per year, which multiplied by five good years per decade make sixty days per decade, which multiplied by six good decades in the century make three hundred and sixty days in all of the nineteen hundreds. a little less than one percent of the thirty-six thousand five hundred plus days in the century. may 26, 1934 (1934.05.26) was the first good day of last century. the last good day was june 25, 1987 (1987.06.25). ever since we entered the third millennium, chances are nil, and the next good date will be june 17, 2345 (2345.06.17). we'll have to wait a little bit, assuming the world won't really end in 2012.
considering the last one hundred and thirteen years, from nineteen hundred to now, the percentage of good days ('eididistic days') is below 0.9%. the actual percentage calculated on the living population, which can be obtained through rather complex calculations cross-referencing the dates listed above with age distributions, is slightly different, but still below one percent and, of course, dropping. prerequisites for admission are rather strict, enrollment is closed for anybody who'll be born in the next three hundred years, the percentage of people who don't stand a chance to join is very high. 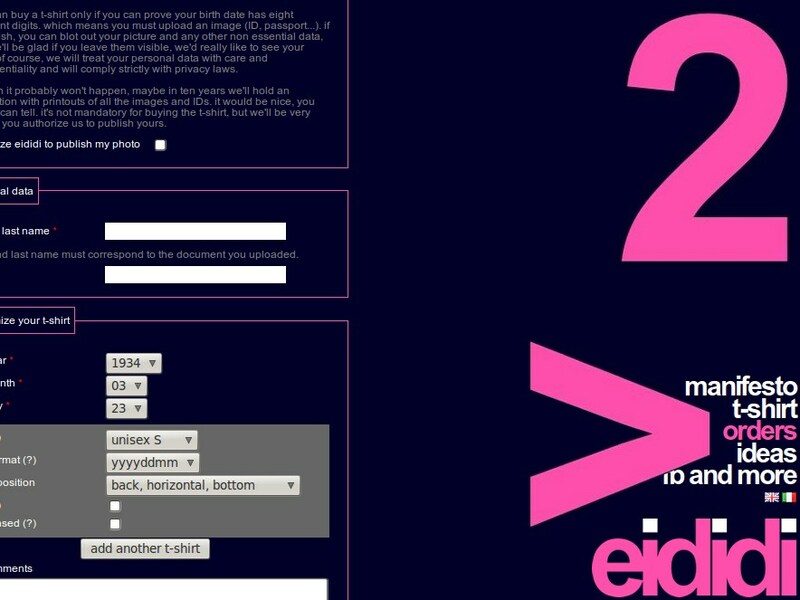 eididi has a facebook page through which we'll try to invite in our club, from every corner of the world, people who have eight different digits in their birth date. to view the page, follow this link. 02.02.2012 - for a limited period, t-shirts are on sale at a bargain price (33 euros). 02.01.2012 - eididi starts today. even if it's not a date with eight different digits. quite the opposite. but we didn't feel like waiting until june 17, 2345.